Now Internet, I know how you get about ambiguity. You like simple things that are quick to learn and then apply to your world. Well, I can do that! Being a stoopid person myself, I can really relate! Now it is MY turn to “think out loud”. Research shows that a lot of our interventions are unnecessary and ineffective especially when explained by the horribly false ideas of “stuck” joints that need mobilizations, tissues that are adhered and need “release”, and complex movement “disorders”. So how are we effective? Let’s talk examples. Category 1 includes things like lateral epicondylitis (or just about any acute tendonitis), adhesive capsulitis, or acute low back pain. They are self-limiting and all spontaneously improve without treatment (Don’t argue at this point, just read on). Category 2 includes things like traumatic Bankart lesions, multi-ligament knee injuries, and severe radiculopathy that have failed conservative care (Again, don’t argue, just read on). Now, it should be obvious that physical therapy would have an essentially minimal role in these first two categories. Sure, we can provide education and/or a referral to a surgeon but that would only be one visit and does not warrant “treatment”. Now we are left with Category 3. What is that and how can we help? First, let’s talk about feedback. Feedback is where the result of a cause has a resultant effect on the cause (Don’t worry, I’ll clarify). Sounds circular? Well, that’s because it creates a loop. A causes B. B then has an effect on A. Repeat. To understand this better, we can look at negative feedback. 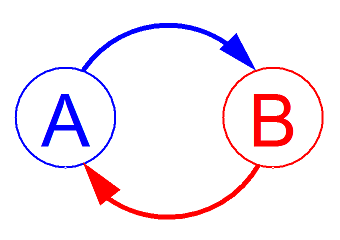 A results in B which then reduces A therefore reducing B. For example, when someone develops lateral epicondylitis from overuse (A), the pain (B) inherently causes the person to decrease use of the affected muscle (A) which results in decreased pain (B). During a negative feedback loop, the system inherently reduces itself. This is what makes it negative – It reduces or takes away the effects. It doesn’t just relate to pain, it can relate to blood pressure, pH levels, respiration, etc. Of course, there are thousands of examples of this not just in medicine but in physics, sociology, geology, etc. Negative feedback rarely needs help. Problems that enter a negative feedback loop solve themselves. But what about positive feedback? In a positive feedback loop, the exact opposite happens. A results in B which then increases A therefore increasing B. This means that the effects perpetuate themselves. The easiest example of this is audio feedback. You know when you are sitting at a conference and the microphone gets too close to an audio speaker? What happens? “Feedback”. The microphone picks up the sound from the audio speaker which then goes through the microphone and back out of the audio speaker. Round and round it goes amplifying itself. That’s why that god-awful screech rapidly gets louder until someone pulls the microphone away. So what does this have to do with orthopedic injuries? Let’s say that my knee starts bothering me for whatever initial reason. I’m worried that I am damaging something so I start favoring that leg. I start doing that hip internal rotation/knee valgus thing we all see and the muscles (specifically quadriceps and hip abductors/external rotators) start getting “weaker”. This is consistent with all of the descriptive studies of these patients. Biomechanical studies have shown that this also significantly increases the contact pressures at the patellofemoral joint. This can result in more pain, which results in more valgus/weakness, which results in more pain, and so on and so forth. That is a positive feedback loop. Another example. I have chronic back pain. I become fearful which makes me hyperaware of any sensation coming from my back. My nervous system associates movement with pain. I avoid moving which results in “weakness” and amplifies the problem. Another positive feedback loop. Keep thinking. What perpetuates general shoulder pain? Chronic lateral hip pain? Tough postoperative cases like ACL reconstruction? Look at the research. Pain -> Fear -> Disuse -> Weakness -> More Pain -> More Fear -> More Disuse -> and so on. I know that seems overly simplistic, but is it really more than that? Sure, the positive feedback loop may consist of other components, but it is still a positive feedback loop. (Side note, the loop does not have to be linear – There can be several loops and/or each component can contribute to the pain or initial problem.) Anything that does not fit that model fits into Category 1 or 2 above. Notice that this does not even worry about the original cause of the problem. It only addresses the perpetuation of the problem. Of course, when you really think about it, perpetuation is the problem! In my opinion, THIS is where physical therapy is most effective – addressing the positive feedback loop. So how do you fix this? Let’s go back to the microphone example. How did we solve that? We pulled away the microphone which did what? THAT BROKE THE LOOP. So how do we break the loop? Well, first you identify the components. In every example I gave, fear, weakness, and disuse are components. By addressing these components, you break the loop resulting in decreased pain. Fear – Educate, educate, educate. Reinforce the lack of a specific known injury/pathology. Expain how fear plays a role in pain. Keep in mind, fear may be the ONLY component sometimes. It doesn’t always have to be more complicated than that. Weakness – Identify areas known to be “weak” in these populations. Use exercises shown via EMG to be most likely to be effective. If these can be performed without pain, go for it! This also reinforces that it is safe to move. Nice thing about weakness is that it can be specifically/objectively measured and specifically/objectively addressed. It also fosters an internal locus of control which is extremely important for these patients. Disuse – More education. Reintroduce functional tasks. Don’t over complicate it or you may bring back fear – “This is too much for me to remember. I can’t do it!” Keep it simple. Do you have to address all of these things? NO! You just need to break the loop. Sometimes just telling a patient, “You’re fine. You don’t have anything serious,” breaks the fear and therefore the loop. My feeling is that fear is probably the most important component. One visit might be all it needs. Of course sometimes it’s more complicated. 1. Will this get better on its own? 2. Does this require a surgical consult? 3. Is a positive feedback loop potentially at play? Remember, positive feedback loops don’t just appear in outpatient orthopedics. That patient in the hospital that won’t get out of bed because they feel too fatigued – what is going on there? Lack of Activity -> Deconditioning -> Feeling Fatigued -> More Lack of Activity -> and so on. In summary: Not “stuck” joints. Not adhesions. Not complex movement “disorders”. Don’t overthink it. Just break the loop. Previous story Does Experience Matter?